There's plenty of space to join us for the celebration - entrance and pedaling the trails is free! A multi-decade lead-up? That deserves a celebration — and we want you there! 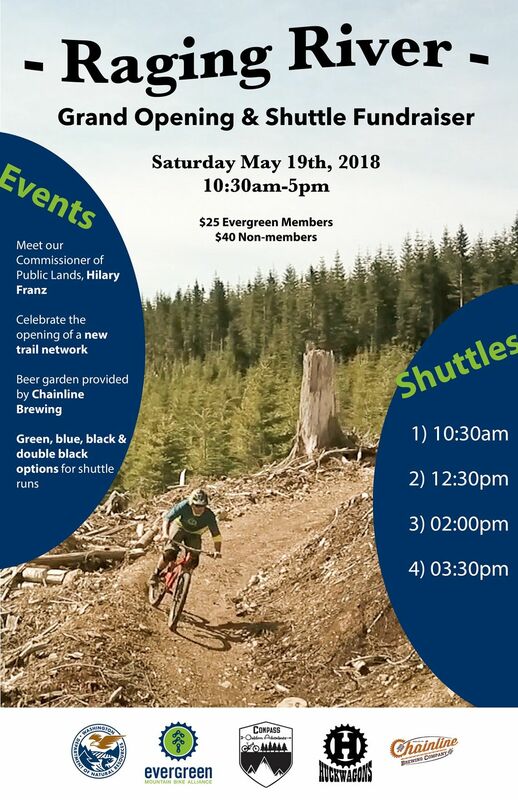 Evergreen, the Washington State Department of Natural Resources and Commissioner of Public Lands Hilary Franz invite you to join us May 19th for our official Raging River Grand Opening Celebration in DNR’s Raging River state working forest near North Bend! And you’ll get to hear from the partners that made a 17+ mile trail system possible — the official ribbon cutting is at noon, with comments from Evergreen’s Yvonne Kraus, and DNR’s Commissioner Hilary Franz. Show your support for more riding areas like this one! What’s else is happening? We’re selling spaces on 4 shuttle waves supported by HuckWagons and Compass Outdoor Adventures as a fundraiser for ongoing maintenance of these new trails. After your last descent, join us in the Chainline Beer Garden to keep that mile-wide grin going. Or grab a bite from a food truck, check out booths from local shops, or rest up for another shuttle run. We couldn’t be more stoked to share these trails with you — the people who made it possible. Join us on May 19th starting at 10 AM, and get ready to ride your face off.